The issue: When patients overcome a life-threatening illness or accident, they often need costly rehabilitative services. In rural areas, the problem is compounded. Rural residents are chronically underserved. For many rural health care facilities, already stretched resources simply limit what is realistically available. 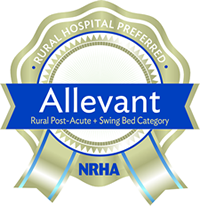 The solution: Allevant Solutions, LLC champions a new, smarter approach for rural hospitals and skilled nursing homes to care for a broader and more complex patient group. By developing new pathways such as high-quality transitional care and vent care, rural facilities can not only keep more local patients, but become a new kind of discharge destination. Through its consulting services, Allevant will help clients learn new methodologies, algorithms and processes. Developed by Mayo Clinic and Select Medical, Allevant's programs integrate innovative clinical services, quality improvement efforts and business expertise. Increase your post-acute care offerings. Reduce costs. Become a new kind of treatment destination.